These images are a continuation of my series on San Diego neighborhood signs. The first shot of the series was “The Boulevard” on El Cajon Blvd and can be seen is this post. There are several of these signs that either are prominently featured on an island divider or span the entire street. A complete list of signs in San Diego can be found here. So that makes four down and one more to go for a certain project I have in mind. Patients and timing are critical in getting a successful shot. 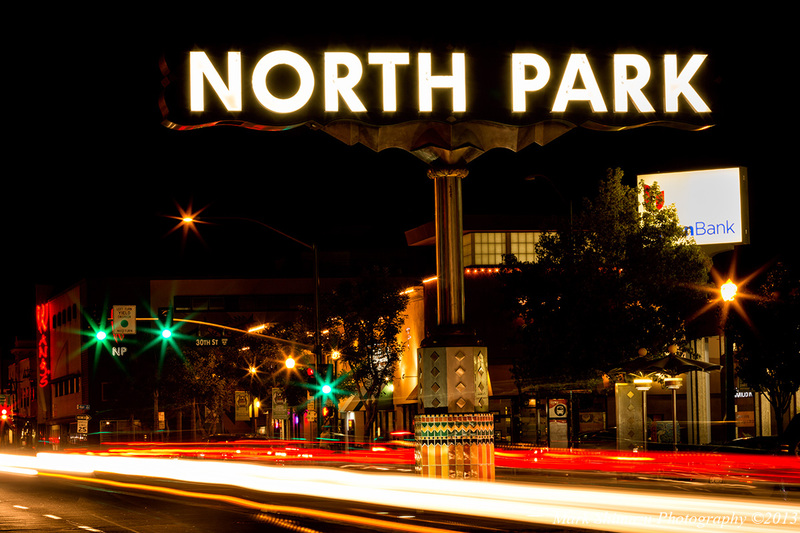 For both the Gaslamp and Northpark signs I wanted to include the activity of the city represented by the streaking car head and tail lights. These light streaks not only serve as leading lines into the image, but also add a dynamic element of activity in a cityscape. To get both incoming and outgoing cars, I had to time my shots with the traffic signals so that cars were going in and out of the frame during the exposure. This took several tries to get the most pleasing streaks. Shooting at the right time of day is also key. 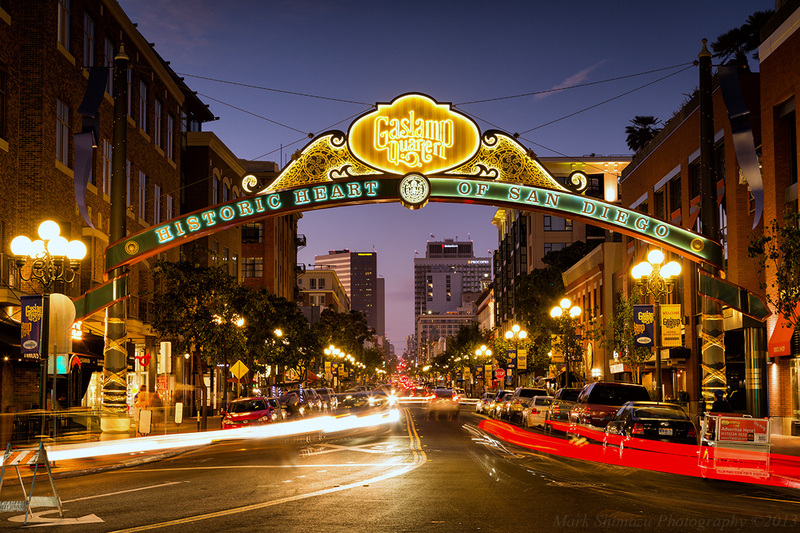 For the Gaslamp shot I wanted to feature the downtown buildings so I shot slightly after sunset so that some light remained in the sky which also served to light up the surrounding buildings with natural light. Some neighborhoods are more photogenic than others and those signs surrounded by strip malls are best shot at night when the signs light up and the rest of the city falls into darkness. The Boulevard and Northpark shots are examples of this. 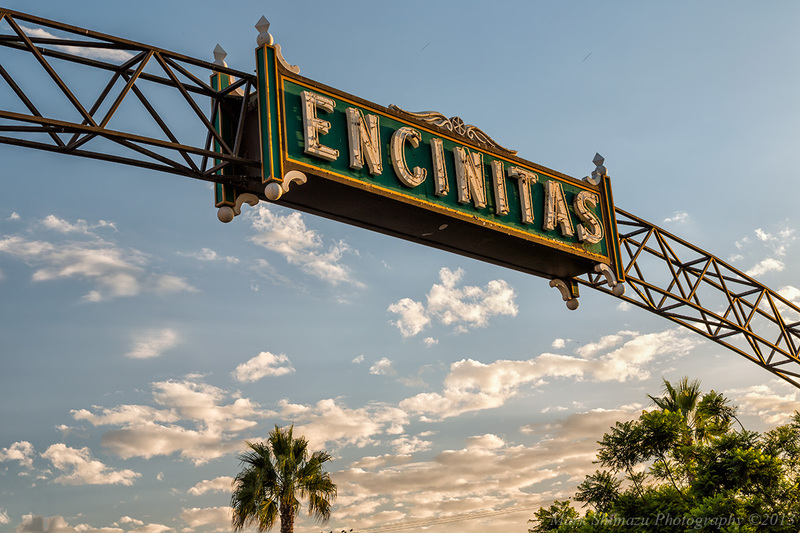 Encinitas is home to the world famous surf spot Swami’s, so I wanted to capture this photo during sunset with blue skies and clouds in the scene to get the “Sunny California” vibe. 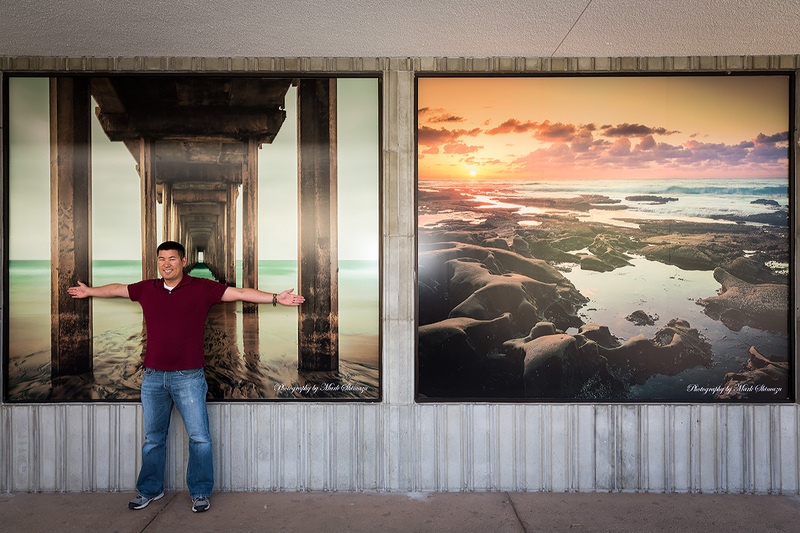 I also framed the shot to include some palm trees to give the image a sense of place for those that are not familiar with the location of Encinitas. 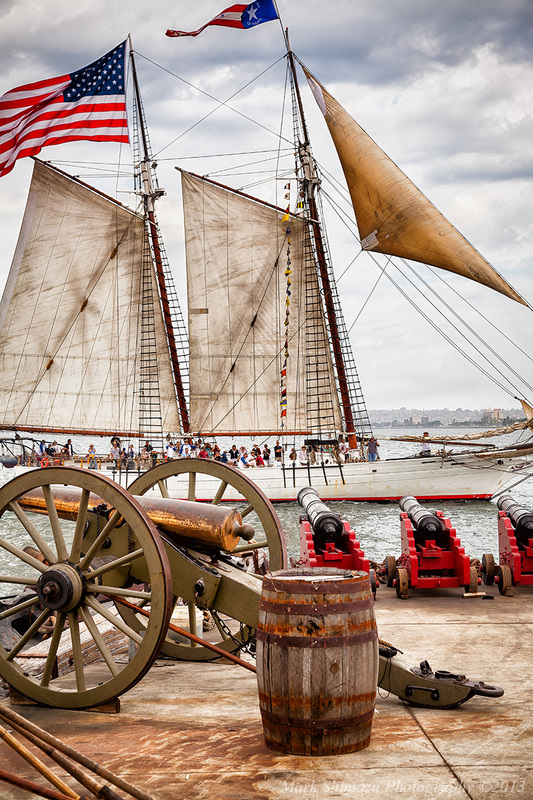 The Festival of Sail is an annual event that takes place on the San Diego Bay adjacent to Downtown during Labor Day Weekend. Numerous tall ships are both on display and are also available for people to take a ride on. These magnificent ships take you back to a time when wind power was the only way to propel your ship. I missed this event for the past two years, but thought I would share a couple of photos from 2011. Due to the time of day I was there, I was forced to shoot in mid-day sun, but fortunately the day had some nice clouds between the areas of blue sky so I could get photos which were not too contrasty. I used a polarizer to darken the sky and to make the white sails of the ships stand out. I brought my wide angle lens to get some interesting compositions aboard the tight confines of the ship, a standard zoom lens as well as my telephoto zoom to get closer to the action of the staged cannon battles. For the first image I wanted to layer the image to show the docks with the cannons in the foreground and the ship in the background. The second image was a classic use of leading lines. 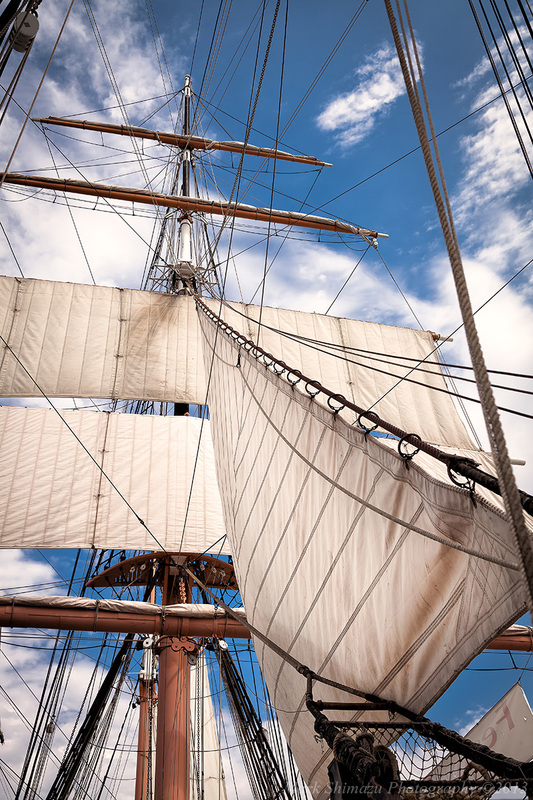 Due to the nature of the ships sails, all lines (ropes) converge into the central mast. I felt that the peripheral lines added interest to the scene and the white sails contrasted well with the blue skies. 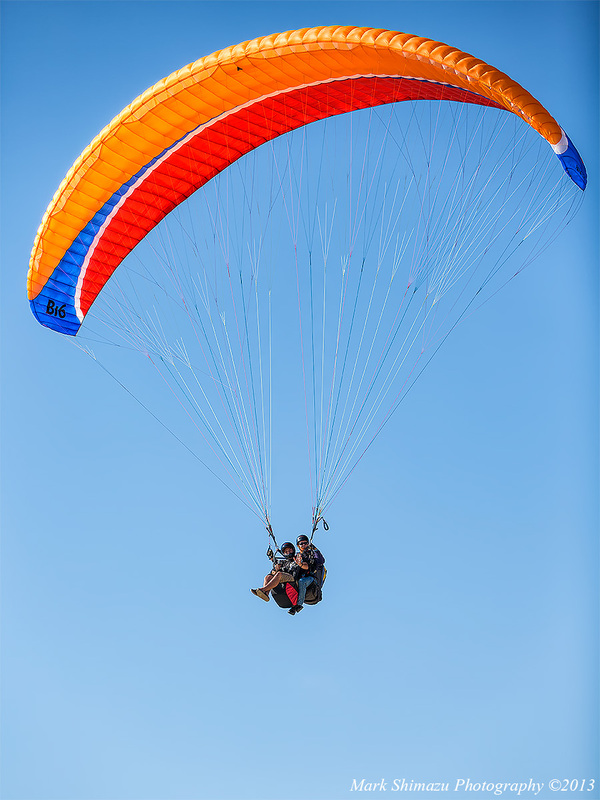 The Sunday forecast called for cool clear skies near the coast and the conditions were going to be great for paragliding. So my wife and I went out on an impromptu afternoon trip to enjoy the weather and hopefully get some nice shots at the Gliderport. This was my second time taking photos here and images from my first trip can be found here. Since the conditions were great for flight with strong onshore winds, the paragliders did not need to make use of the runway area to lift off. This resulted in the pilots spending most of their time lifting off from the far end of the runway near the cliffs. This meant I was not able to get great photos from the area I shot from last time just outside the pilots only restricted zone. 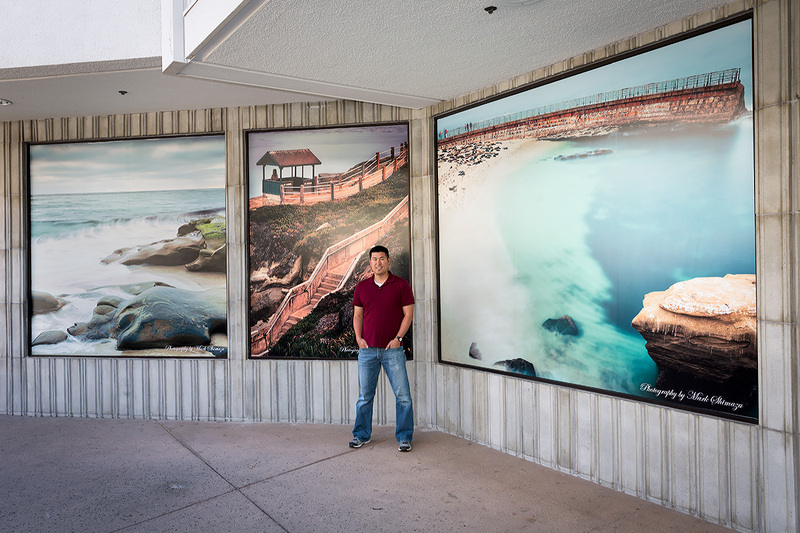 This turned out to be serendipitous since I had to re-position myself and found a location near the sheer cliffs overlooking the beach and ocean. 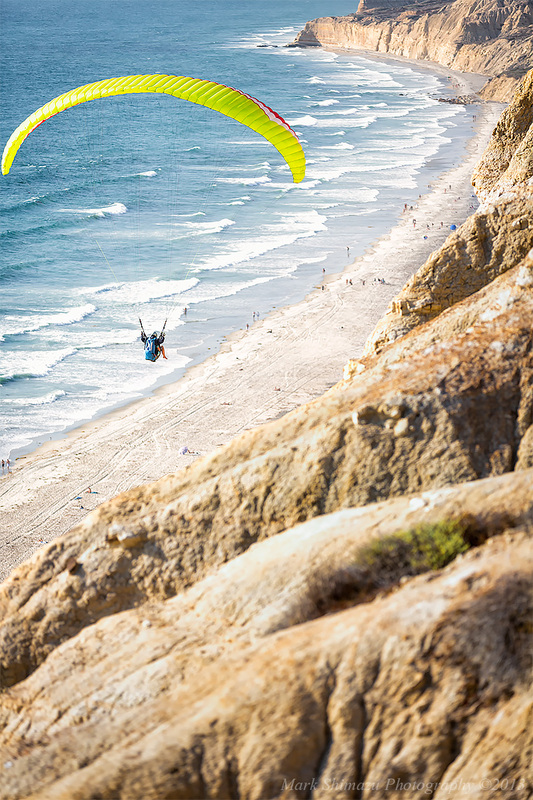 I immediately knew I would be able to get some great shots of the paragliders against sky with the ocean, cliffs and beach providing context to the place. Luckily, the sun was also in a favorable location relative to the direction I was shooting and provided a nice 45 degree angle of light on the subjects. Just to give you a sense of how high these cliffs are, see those dots on the beach? Those are beach goers enjoying the sun and surf. I shot all of the images with the Canon 70-200mm f/2.8L IS II USM with a circular polorizer attached to darken and saturate the sky. 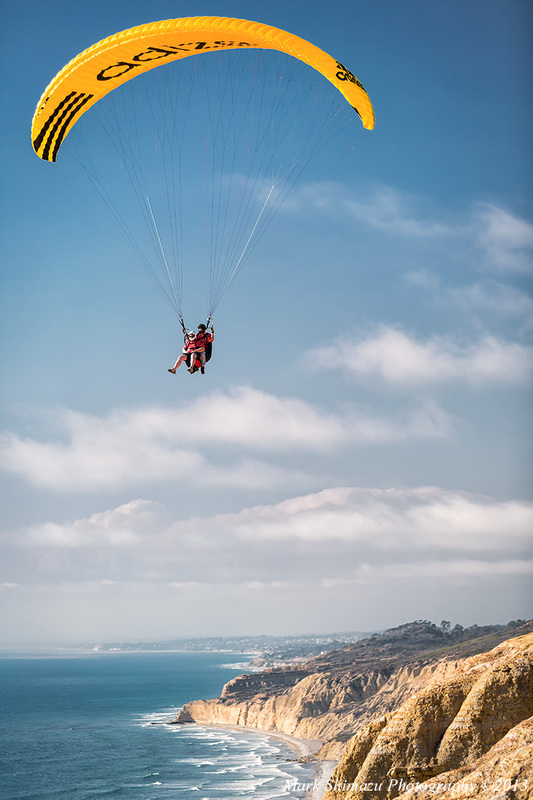 I shot wide open at f/2.8 which gave me a shutter speed between 1/500 and 1/640s (it was this low due to the ~2-stops of light I lost due to the polarizer) which was fast enough to freeze the paragliders. I shot in Servo autofocus mode and in continuous high speed to increase my chances of getting the action, composition and focus accuracy I was after. The last time I photographed the Coronado Bridge I chose to do so from a nearby beach where I could use boats used to access the ships moored out on the bay as foreground objects. 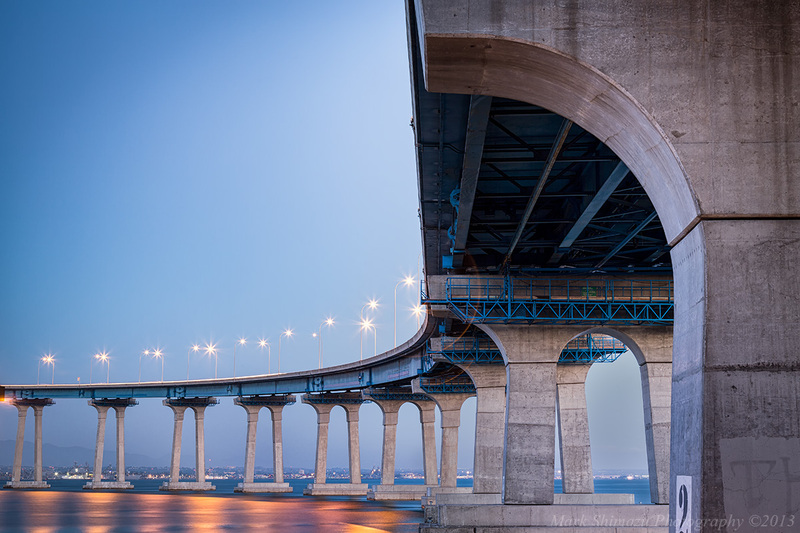 Although the light was nice and the composition pleasing, what I realized when viewing the photos at home on a large monitor was that I did not adequately capture the uniqueness of the Coronado bridge. The bridge as I captured it looked like any other bridge and appears to be a pedestrian connection between two land masses when in fact the bridge makes a sweeping right turn going into Coronado from San Diego. It was this striking feature that I wanted to capture with this photo. The shot was more difficult to get than I initially though when I had planned and conceived it in my mind. The problem was that there is a 8-foot fence on both sides of the path immediately surrounding the underpass of the bridge. This meant getting a clean composition without the barb wired and chain linked fence was going to be a challenge. Luckily, there is an embankment with a concrete structure right under the bridge. It was a little tricky positioning my tripod in a stable position on the embankment, but it allowed me to shoot over the fence (just barely) and get the composition I wanted. The night was clear without any clouds which I preferred since I wanted to emphasize only the form and textures of the bridge itself. Dramatic clouds, although pleasing, would have distracted from this goal. The smooth sky in the upper left of the image, I feel, contrasts well with the strong lines of the bridge. Due to the sky being darker than some parts of the bridge (and much darker than the underside of the bridge) I had to use a 3-stop graduated ND filter. Can you guess how I placed the filter? The graduation actually runs from 12 o’clock to 6 o’clock with the graduation placed vertically in the frame. This allowed me to even out the shaded portions of the bridge from those being hit with light. The shot was made after the lights of the bridge had turned on and had sufficient time to warm up. This occurred around 20 minutes after sunset. One thing that I did not notice at the time of shooting are the flare patterns the street lights created in the middle of the frame. Although I typically try and avoid lens flare in my images, the pattern created in this case was pleasing and I feel adds to the overall photo. I used an aperture of f/11 since the first bridge pylon was a good 50 feet or so away. The bridge spans around a mile and this f-stop gave me plenty of depth-of-field. The resulting shutter speed was 30 seconds and this was enough to help smooth out the water in the bay, again helping to focus on only the strong lines and textures of the bridge. This is similar to the shot I showed yesterday, but in landscape, from a slightly different location and shot around 30 minutes before sunset. Although the scene is similar, the mood is different in each image. As with the photo from yesterday, I tried to layer the image as much as possible by interweaving the rocks with the incoming tide. Just to the right of the frame are some homes that I chose not to include in the composition to give it more of an “out on the beach far from civilization” look even though I was right in the middle of La Jolla. I used f/16 to get a large depth-of-field and wanted a shutter speed to show some, but not too much motion in the waves. There were some breaks in the marine layer that allowed for some light to come through (way on the horizon you can see some God rays) so I used my 3-stop graduated ND filter to even the exposure of the sky to match that of the foreground. This filter is a must have if you are a landscape photographer and I use it on about 80% of my landscape shots. There are many choices in terms of number of stop reductions and manufactures, but if I were to only buy one, it would be the graduated 3-stop (0.9) from either Lee or Singh Ray. You will also need the Lee Foundation holder and proper adapter ring to match your len’s diameter. Next time out I hope to have clearer skies as the last half dozen or so times I have been out to the coast, it has always been overcast during sunset. I was after some surfer/surfboard shots this weekend and headed down to a popular local surf spot, Windansea in La Jolla. Although I did not come back with any of the shots I was originally after, I was able to get some decent seascape shots of the rocky coastline. One of the many challenges that photographers face is how to convey a sense of depth in a flat 2-dimensional image displayed either as a print or on screen. There are several techniques available to us including composing for a strong foreground, middle and background, the use of leading lines and layering an image just to name a few. 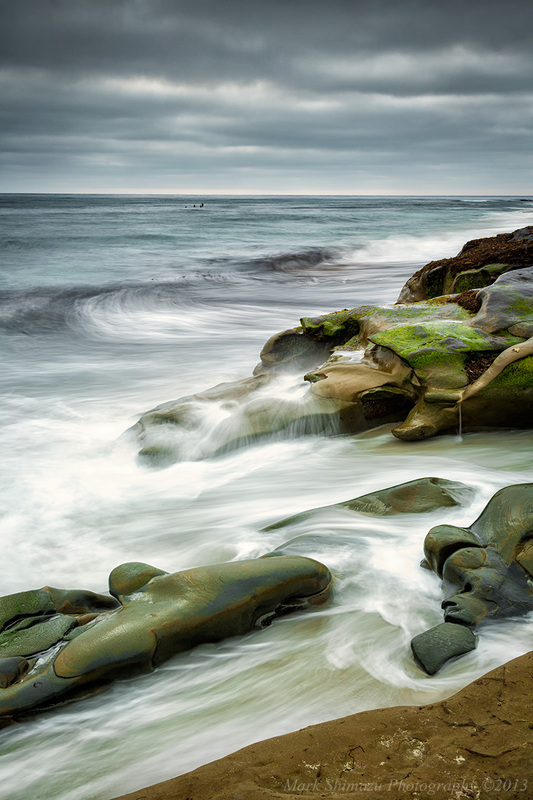 I chose to use the layering technique by carefully composing my image so that the rocks formed layers between the incoming tide and ocean. Can you imagine the above image without the rocky ledge in the bottom of the image? Not including this would have resulted in less apparent depth in the image. The image itself was taken around sunset, but even though the marine layer had already come in some light was still able to penetrate the clouds giving this image a dark stormy look. 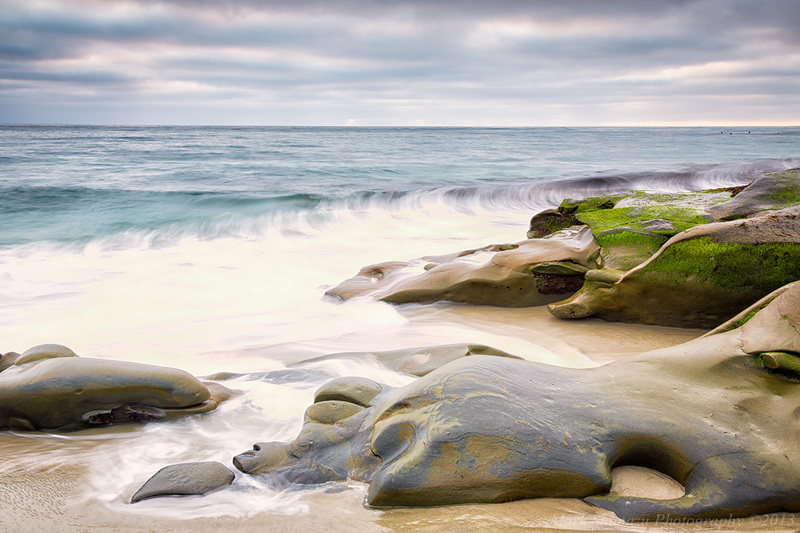 Despite the overcast conditions, I still needed a 3-stop graduated ND filter to balance the exposure of the sky and foreground rocks. I used an f-stop of f/16 to get everything from the foreground rock to the horizon in focus. I wanted a relatively fast shutter speed to capture the motion in the ocean and retain most of the shapes of the incoming waves and not turn the ocean into a uniform mass which would have happened if I used a long shutter speed such as 15s. I also paid particular attention to the incoming and outgoing tide waters in the two foreground channels and wanted a photo showing the swirling pattern they created. It took around 15 minutes for me to get the combination of wave motion and swirl patterns which I feel make this photo successful. Oh and those black spots you see in the ocean near the horizon line, those aren’t dust spots but surfers.